When the time comes to renovate a room, such as a basement, to turn it into a more comfortable living space, wallpaper provides a large variety of decorating options. The problem is that basement walls are often rough and uneven. If the walls aren't prepared properly, all of the wall's imperfections will show through the wallpaper after it is hung. The primary task in hanging wallpaper on rough walls is to clean and repair the walls to hide the imperfections. Wash the walls with trisodium phosphate and a sponge. TSP is an all-purpose cleaner that will get rid of dirt, grease, grime and other contaminants that prevent the wallpaper from adhering properly to the wall. Clean mildewed spots on the wall with a mixture of household bleach and water. Use two cups of bleach per one gallon of water. Allow the walls to dry. Scrape off loose and flaking paint with a wire brush or putty knife. Repair cracks and holes with latex caulk and spackling. Apply the spackle to small nail-size holes with a putty knife or your finger. Place the latex caulk in a caulk gun and caulk the larger cracks. Sand the walls with a medium grit sandpaper until they are level and smooth. 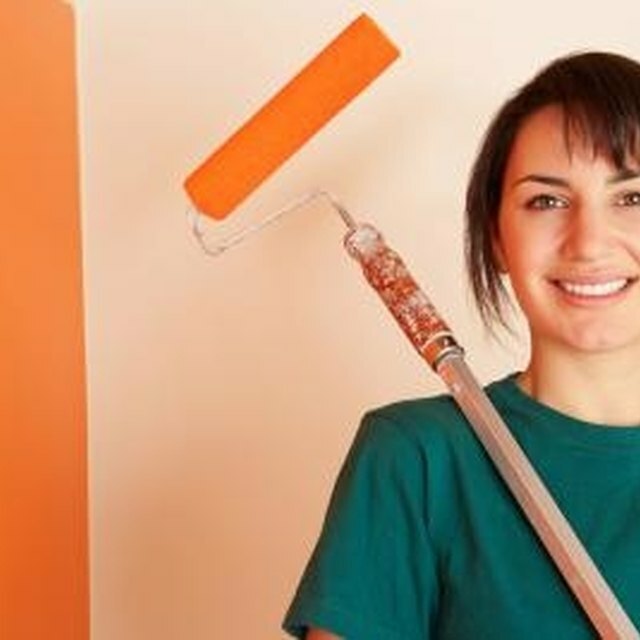 Apply a primer coat to the walls with a roller and brush. Use a good quality latex primer/stain blocker. Choose a wallpaper texture that camouflages the imperfections in the wall. Avoid wallpaper that has a shiny background. Choose wallpaper with more neutral colors and that has small designs and prints. Another option is to prepare the walls with a skim coat of joint compound. The skim coat covers the imperfections in the wall and provides more choices in selecting a wallpaper style. Apply two light coat of joint compound to the walls. This is referred to as a skim coat. The skim coat hides the imperfections in the walls so that the wallpaper will be smooth and even. Start at the top of the wall and apply the joint compound with a 4- to 5-inch putty knife. The compound should be applied evenly and smoothly. Don't leave a hard edge or ridges. Lightly sand the first coat after 24 hours with a sanding block until the wall feels smooth. Repeat the procedure with the second coat.